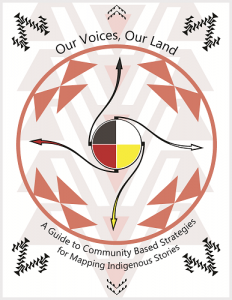 Our Voices, Our Land: A Guide to Community Based Strategies for Mapping Indigenous Stories is a toolkit that assists native and tribal communities in using storytelling and mapping for cultural preservation. Many native and tribal communities across the US constantly struggle to protect their land, cultural resources, and sacred sites against development and resource ex­traction. Our Voices, Our Land features guides on how to gather stories and combine them with digitally mapped locations of community assets. It details research planning processes, how to conduct interviews, and how to create maps using Global Positioning Systems (GPS) and Geographic Information System (GIS). This toolkit emerged from our Research for Community Power Program. In 2008, the Winnemem Wintu, with help from DataCenter, combined organizing with research to fight the expansion of the Shasta Dam – an expansion that would erase 36 of the Winnemem Wintu’s sacred sites. The project correlated GPS locations to the rich stories and traditions of the sacred sites. The data produced is being used to reveal the irreparable destruction the dam expansion would cause. For years we’ve worked to position research as an essential facet of grassroots organizing for social change. Now, we’re turning the workshops and training materials we’ve devel­oped along the way into free and acces­sible toolkits. With these tools, many low- and no-budget organizing efforts will be stronger, more strategic, and better poised to make the change they want to see. We’re all ex­perts, and with the right tools we can leverage our expertise to create lasting social change.